Pam works closely with co-director Alex Jackson as well as Assistant Directors, Jai Cobb Kells and Barb St. Peter, to foster successful experiences for your daughter at Runoia. Guiding campers and counselors alike toward meaningful camp moments is a main part of Pam’s role at camp. Sharing the enjoyment of outdoor activities is also important to her. Pam’s interest in outdoor education and environmental studies, lead her to complete a BA degree in Human Ecology from College of the Atlantic. Guided by her love for camp and working toward complete her MBA at Northeastern University in Boston in 1994, Pam purchased the Cobb family business. 2018 marks the 30th year Pam has worked and lead at camp and nurtured Camp Runoia. A recent six year Executive Board member of Maine Camp Experience, a past President of American Camp Association/New England and the Maine Youth Camping Association, Pam’s professional ties to the camp industry run deep and strong. 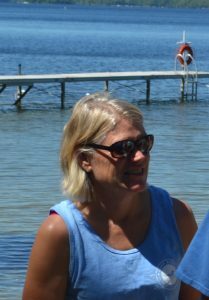 A fourth generation camp director in the state of Maine, Pam continues the Cobb family tradition of owning and operating youth camps in Maine. Pam’s husband Mark Heuberger, an environmental consultant, is also hands-on at camp throughout the summer and year round. You will often find Pam and Mark singing camp songs, meeting with campers and staff and families, teaching water skiing and sailing, and strategically planning for Camp Runoia. When not immersed in the camp season, Pam and Mark can be found snow shoeing or hiking with their dogs, sailing on the lake or the ocean, doing something outside or avidly following New England sports teams. A member of the Runoia staff since 1995, Alex Jackson originally hails from northern England and now lives in Maine. She first encountered American summer camps while studying for her BSC in Physical Education and Sports Science. After completing her teaching certification, Alex worked with youth – both in the classroom and outdoors with an emphasis on experiential education. Alex holds her Masters degree in Camp Administration and Leadership. With twenty plus summers at Runoia Alex is a dedicated camping professional. Mainly focused on program development and staff hiring during the “off season”, Alex is the hub of camp programming in the summer months. 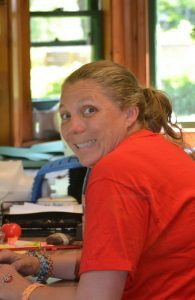 Working closely with Assistant Program Director, Jen Dresdow, she carefully guides campers to choose variety in their schedules and masterminds the program for both campers and staff for the in-camp program as well as out of camp trips. eas she focuses on during the summer. She is still finds time to be hands-on teaching campers on the ropes course or at the lake. As an American Camp Association Standards Visitor, Alex takes a keen interest in the safety of all our program areas in and out of camp. A Maine resident, she enjoys many seasonal outdoor activities with her active family, including her three children, and works year-round for Camp Runoia from her Raymond, Maine home. She enjoys singing with a local women’s and serves as Chorus President. A foster dog can often been found hanging out with her during the winter. Alex loves to be busy!